Whether you travel to Swiftwater Cellars for business, leisure activities or an event, our dining options will suit every need. Our Fireside Lounge features an all day menu, happy hour, specialty cocktails and beer and wine. During those months when the sky is blue and you’re dying to dine outside, our patio adjacent to the Fireside Lounge is the place you’ll want to be. Even as the evening comes, our large fire pits will keep you warm and cozy. The patio also extends outside the Hoist House Restaurant if you choose to have your Hoist House dining experience outside. Besides the captivating views, you’ll be equally entertained by your backyard view of golfers teeing off on the Rope Rider Golf Course. Having spent more than 30-years in the food industry Don Watts knows the importance in using the freshest, highest quality food sources available. 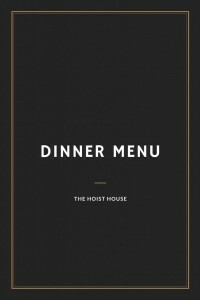 As a result, our Hoist House Restaurant offers the freshest ingredients as they come into season. From well-established food producers to Lori Watts’ father (tomato farmer), whoever can grow or provide the finest foods to us is considered our most valuable resource. Grown on the free range pastures and rolling foothills of the Willamette Valley, the Anderson’s have been raising Oregon lamb for 5 generations and take great pride in their premium, high quality lamb. Born out of passion for the western lifestyle and a responsibility to the families that create their livelihood from agriculture, Double R Ranch is part of a family owned farm established in 1968. They are recognized as a leader in providing exceptional quality beef and are located in the Okanagan region of Washington State. Snake River Farms cattle are raised along the high plains of the Snake River in Eastern Idaho. American Wagyu Beef is extremely tender and delicious, raised from the finest stock in the best environment for an intense and succulent beef flavor always savored and enjoyed. Snake River Farms also provide 100% purebred Berkshire breed pork, ensuring a consistently exquisite savory experience. Often referred to as Kurobuta, Berkshire Pork has been celebrated around the world for many reasons, especially for its marbling and succulent flavors which are its most distinctive characteristics. Established in 1941 as a small retail shop in Portland, Oregon, Pacific Seafood has become a leader in the seafood industry. Based on their philosophy and commitment to “consistently do our best and always strive to do better”, Pacific Seafood commits itself to providing the freshest seafood available. With origins rooted firmly in Seattle’s pioneering artisan coffee culture, we produce high quality espresso and drip coffees, roasted using only the finest green beans and traditional Italian methods. You may book your table reservation online. Enter your party’s needs in the form to the right, and we will search for table availability. 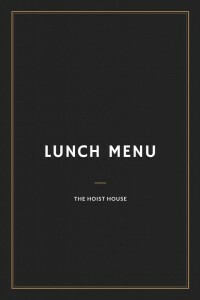 You can also contact the Hoist House for more information.